I've been spending the last week or so on this and finally put it up on the site - a little something about the different types of fabrics used in clothing, and their suitability for outdoors activity. Please have a look at this page and by all means please leave a comment if you agree or disagree with me on anything. I've been sitting on this for a few days now because I really wanted to write something to honour Phil Cotton but I felt like it was not my place because I did not know him. I just know of him. I believe we only exchanged words one single time on the MyCCR forums, so that was the closest I ever got to him. But wow it is difficult to be passionate about canoes and not know who he is - he is right up there with Bill Mason and in some ways his accomplishments in the canoeing world are possibly even greater. It is probably just because his stompin' grounds were in an obscure remote location - Wabakimi Provincial Park - that most people had never heard of him. Phil spent his entire life advocating for the preservation of our wild spaces, and was just at home in meetings with government officials as he was in the classroom where he spent 40 years as a music teacher. But it was not until he retired from that profession that he did something which truly elevated him to the status of "legend" - in 2004 he started the Wabakimi Project to map historic canoe routes in the park and the crown lands surrounding it, and 10 years later in in 2014 he founded Friends of Wabakimi to carry this legacy forward. At a point in his life when most people are considering slowing down, Phil Cotton made the decision to spend most of his summers in a canoe living his passion for the outdoors. And really I think it is best to use his own words to underscore what an incredible impact he's had. In January of this year he posted his annual message to the MyCCR forums soliciting volunteers for this summer. Sadly, this was to be the last year of the project, so Phil never got to see it to the end. Here is what Phil wrote in January, and you can follow the link in the previous sentence to read the entire thread. The first time I saw a camping hammock was back in 2012 when I hiked the Kenomee Canyon loop in Nova Scotia with a friend and another friend of his. We hiked in to Murphy Brook and camped at the bottom of the big steep hill right on the brook, for anyone familiar with the area. Oh, and if you happen to have been there since 2012 - we were the ones who built the lounge chairs out of the big flat boulders. I'll see if I can dig up some pictures of them. Anyway, my friend brought his Hennessy hammock, and I ended up pretty intrigued by it mainly because it was so much lighter and smaller than even a small tent. 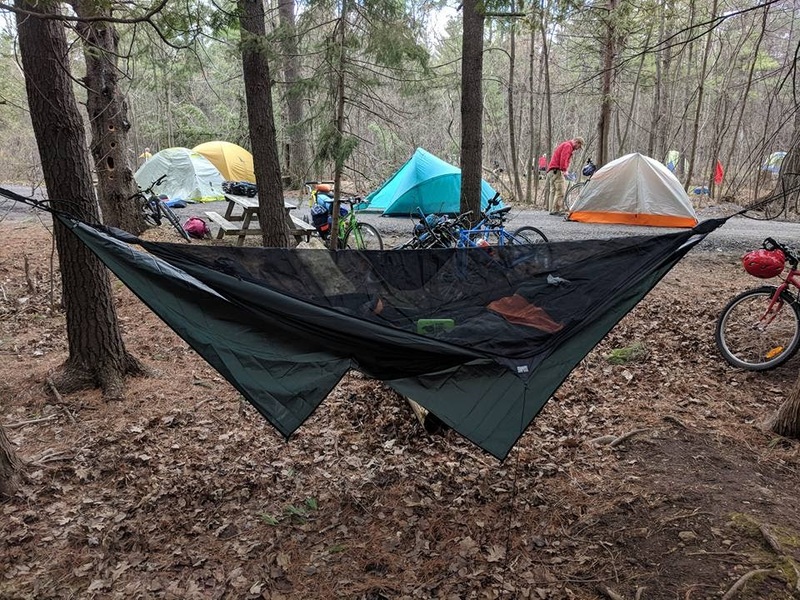 Fast forward 2 years and I moved up from Cubs to Scouts with my oldest son, and discovered that the Scout troop had a couple of the same type of hammocks for use by Scouts on camping trips. Indeed, the hammocks were always and still are a very popular option for Scouts, and there is always a higher demand than supply. As five years with the Scouts draws to a close I've seen the hammocks used quite a bit. And more recently one of the other Scout leaders picked up a really nice custom hammock from Little Shop of Hammocks in Saskatchewan. Being the cheapskate that I am I did not really want to shell out the price of a new hammock ( over $250 when you include taxes ) for the sake of trying it out, but being a kijiji junkie I was eventually able to find a great deal on one. Last summer a good Hennessy came up for $100 and was listed as used only a couple of times. When I went to check it out I confirmed that it sure looked barely used, and was the deal I'd been looking for. I knew that in the worst case both of my older boys loved using a hammock since they'd both used the ones in Scouts, so even if I did not like it we'd use it on our family camping trips. I picked that one up late last summer and had not had a chance to try it out before winter set in.